Why stay anywhere else&reg Make The Holiday Inn Express Hotel and Suites Convention Center your first choice for your next trip to Houston, Texas. Located in beautiful downtown Houston one block from the Houston Toyota Center, Houston Rockets headquarters, and two blocks from the Houston Convention Center, Houston&regs biggest convention center. Astros fan&reg We are just 0.5 miles from Minute Maid Park and the Astros, 2 miles from the University of Houston, 3 miles from the Texas Medical Center, and 6 miles from Reliant Stadium. 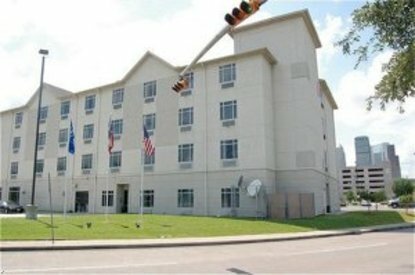 The Holiday Inn Express is within a mile of Exxon-Mobile, Chevron, Shell, Meridian, Lyondell, Planned Parent Hood, as well as restaurants and the Houston Theater District.In a hurry&reg Stop by our complimentary hot breakfast bar and pick up a warm cinnamon roll or a biscuit with gravy, or you can pick from our other favorite selections. Whether you are traveling to Houston for business or leisure our hotel accommodation has all of the must have amenities you expect and more: free parking, large heated pool, business center, fitness center, free wireless Internet access, ATM on site. Enjoy spacious guest rooms, incredibly friendly employees and service. We are sure that on your next trip, you will make Holiday Inn Express Hotel and Suites your first choice. This hotel is committed to providing accessible facilities under the American Disabilities Act. If your accessibility needs are not met, please contact the Hotel Manager on Duty. Should you require additional information regarding accessible facilities for guests with disabilities, please call 1-800-Holiday (U.S. and Canada) or contact the hotel directly. For the hearing impaired, TDD service is available at 1-800-238-5544 within the U.S. and Canada.